George Graham Reviews Julian Dawson's "Move Over Darling"
Though the singer-songwriter is usually considered an American musical phenomenon, having arisen during the 1960s folk revival, there are quite a few outstanding British practitioners of the art. Many of them came out of the late 1960s English folk scene, such as Richard Thompson, Ralph McTell, Iain Matthews, John Martyn, plus the late Nick Drake and Sandy Denny. In more recent years we have seen people like Clive Gregson, John Wesley Harding, and Eddi Reader, whose album we reviewed just last week. This time, we have another veteran English singer-songwriter who has not had very high visibility in the US, even though he has done most of his recording in this country. 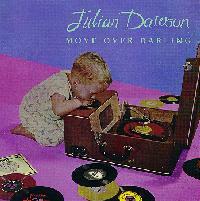 Julian Dawson has just released his latest album entitled Move Over Darling. Julian Dawson's biography, as provided by his record company, notes that he was born on the 4th of July 1954, in London, as Elvis Presley was preparing for his debut sessions for Sun Records in Memphis. That's a fact that enters into one of the songs on this fine new album. Dawson's background is rather similar to that of many of the British rockers of the 1960s, including being a bit of a troublemaker in parochial school, then going to art school where he was to have studied painting, but instead got involved with bands there, finally deciding that he preferred singing to painting. Like the Beatles before him, he travelled to Germany to hone his performance skills, having his first professional gig in a band that played for US soldiers stationed there. After returning to England, he began his recording career with a joint project with former Traffic member Rosko Gee. In 1990 he did his first American recording called Live on the Radio, and the following year recorded an album produced by Gary Tallent of the Springsteen E-Street Band, which featured a number of Nashville notables, including Vince Gill, Jerry Douglas and Barry Beckett. Dawson followed that with Headlines, also done in Nashville with guests including Duane Eddy, Bill Payne of Little Feat, and Steve Forbert, an album released only in the UK, so far as I know. Among his more recent efforts has been a group called Plainsong with Iain Matthews, Andy Roberts and Mark Griffiths, touring Europe with and opening for Fairport Convention on their tour. He also produced an album with country music veteran Charlie Louvin last year. Louvin included three of Dawson's songs. For his latest album, Dawson went to New York and worked with Steuart Smith of Shawn Colvin's band in an intimate, laid back session with mostly acoustic instrumentation and no drums. The notable guests this time include the Roche sisters, Richard Thompson and bluesy singer-songwriter Dan Penn. The result is an outstanding record that serves as a reminder of just how fine a writer Dawson is, and for those who may not be familiar with his music, an excellent introduction. The album's title, Move Over Darling, comes from one of three cover songs Dawson does, in this case a tune made famous by Doris Day. But the bulk of the thirteen tracks are original songs that usually explore personal relationships in a gentle but perceptive manner, delivered in Dawson's appealingly relaxed voice. The scaled back arrangements and spartan studio technique allow one to focus on the songs, with just some acoustic and electric guitars, a little banjo, harmonica, and an old-fashioned electric piano providing most the backing. Julian Dawson is one of those veteran British singer-songwriters who has not received the kind of recognition in this country as some of his compatriots, such as Richard Thompson -- though Thompson himself is perennially considered one of the great so-called "unknown" artists in the US. Interestingly, Dawson has done much of his recording in America. This new album, a delightfully laid back, mostly acoustic collection of his fine songs on an Nashville-based independent record label, is probably in no danger of hogging the number one position on the commercial music charts. But for those who appreciate the art of the singer-songwriter, Move Over Darling is a delight, with a generous collection of excellent songs performed in a relaxed, intimate setting. Dawson's appealingly easy-going vocals along with the sparse but very tasteful instrumentation -- with an almost living-room aura -- make this the kind of record one will want to go back to many times. The technical quality of the record is commendable. The mix is as uncluttered and understated as the music, and captures the mood well. Stewart Lerman recorded and mixed the album, and served as co-producer with Dawson and Smith. Julian Dawson, though a British folkie, has more in common with American singer-songwriters than some of his fellow British subjects. His new album is a nearly ideal showcase for this outstanding, but still relatively unknown long-time artist.